Made mostly with fruit from our younger vines, this wine already shows a deep ruby color and earthy aromas of forest floor, pine, and truffle, highlighted by notes of bay laurel, violets and herbs de Provence. In the mouth, its full-bodied concentration coats the palate with fine tannins and vibrant flavors of sweet, black fruit, finishing with nuances of wet granite and spice. 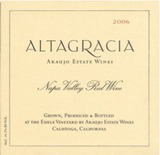 Notes winemaker Francoise Peschon: "From the perfumed nose to the long mineral finish, the 2006 Altagrácia is a wine of focused flavors, beautifully balanced with dark plush fruit, enlivening brightness and magical notes of minerality. It is wine to enjoy now or age for 10 years and beyond."